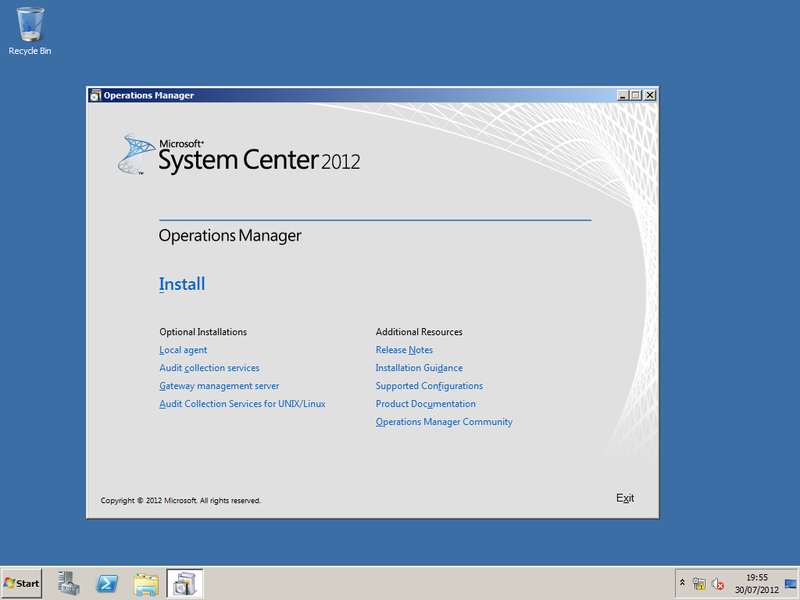 Microsoft System Center 2012 Operations manager is one of the first next generation monitoring tools. It provides new network capabilities that provide IT pros the ability to monitor and diagnose efficiently and effectively. 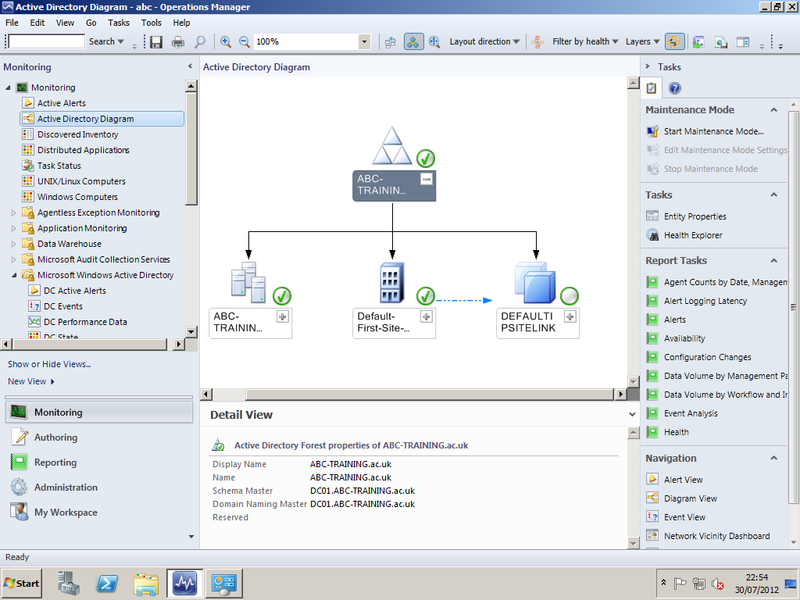 Operations Manager provides monitoring to most network devices and includes SNMP V3 support. 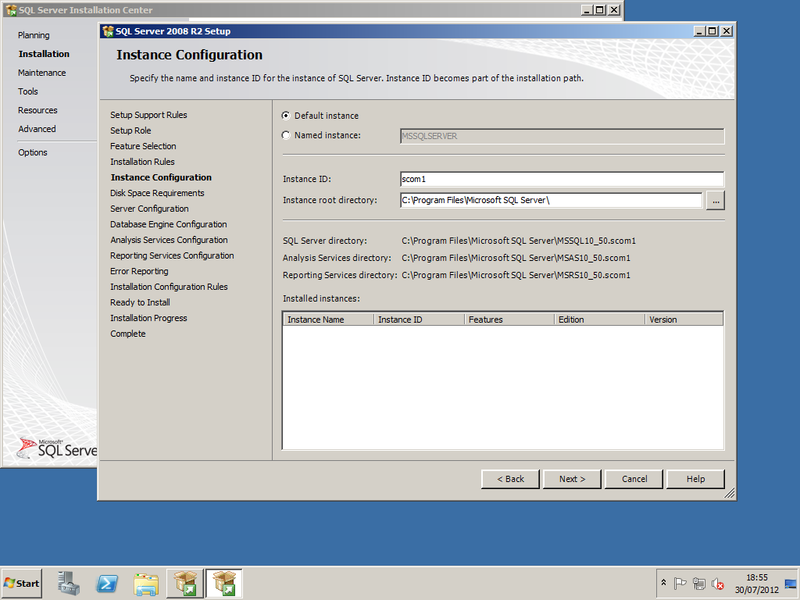 This post shows you how to deploy Operations Manager on a single server. This is ideal for proof of concepts and training purposes. 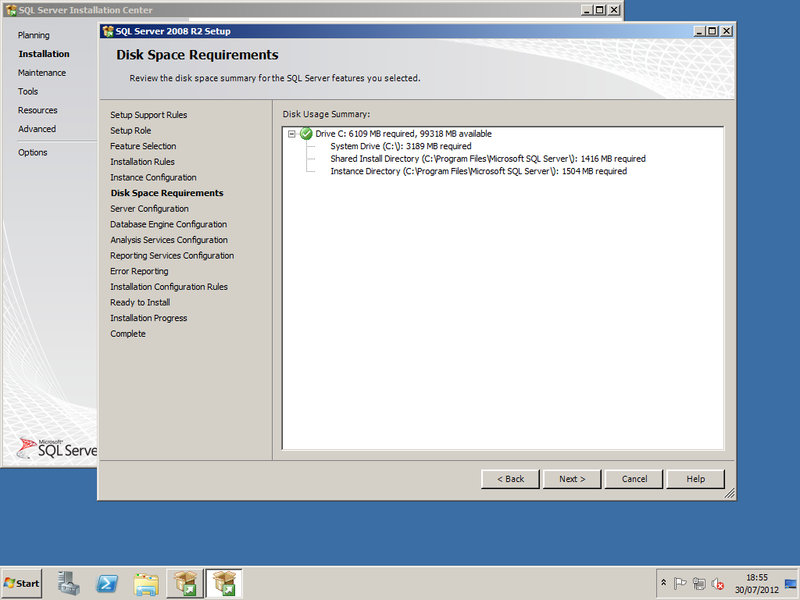 Point to note: for deployments to production environments, you will require larger server hardware specifications and database sizes. Best practices dictate that databases should be separate from the management server and preferably configured as a cluster. 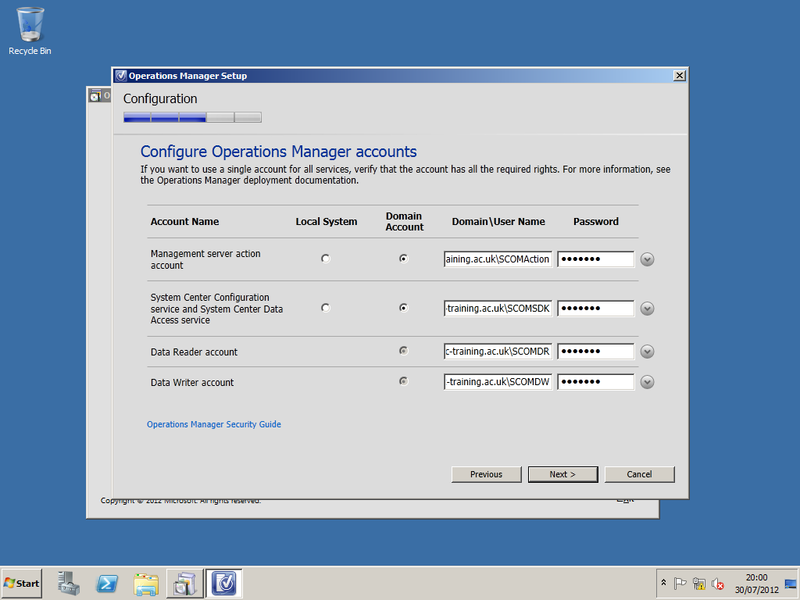 Operations Manager requires the following user accounts to be created in an organisational Unit (System Center). You will need to set the account SCOMSDK as a local admin. 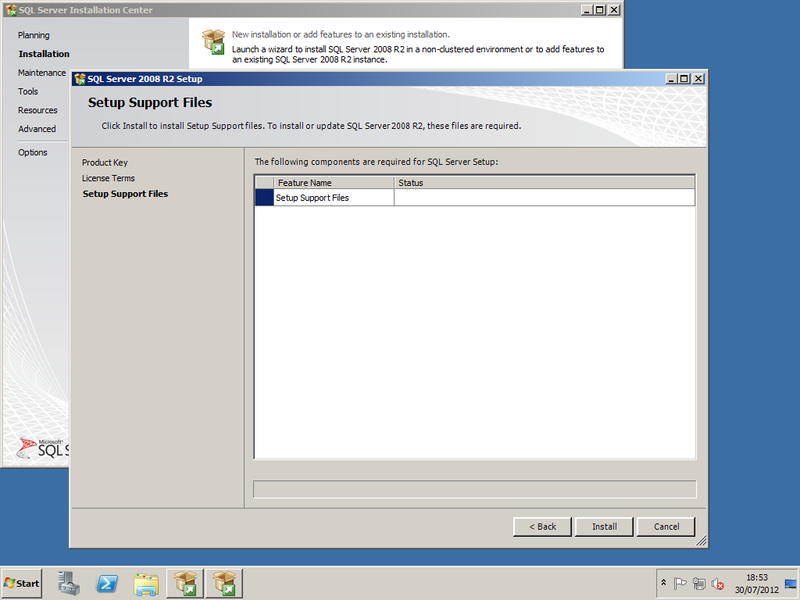 Ensure that the .NET Framework 3.5.1 feature is installed. 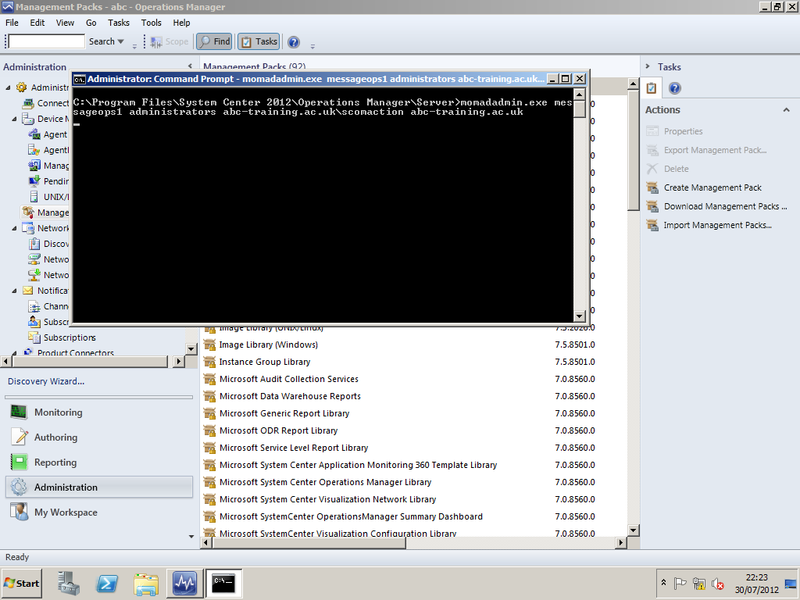 You can install this role using PowerShell. 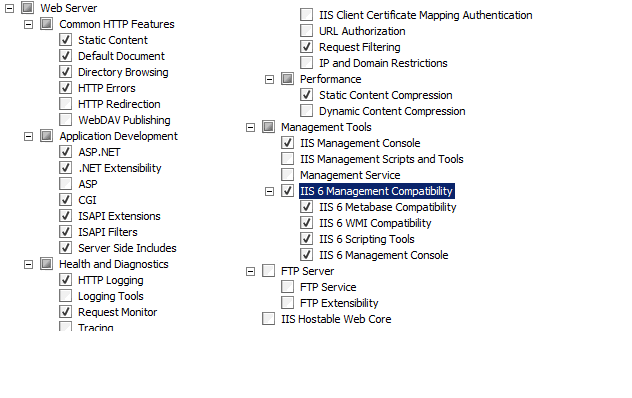 Installation of the web console requires that ISAPI and CGI Restrictions in IIS be enabled for ASP.NET 4. 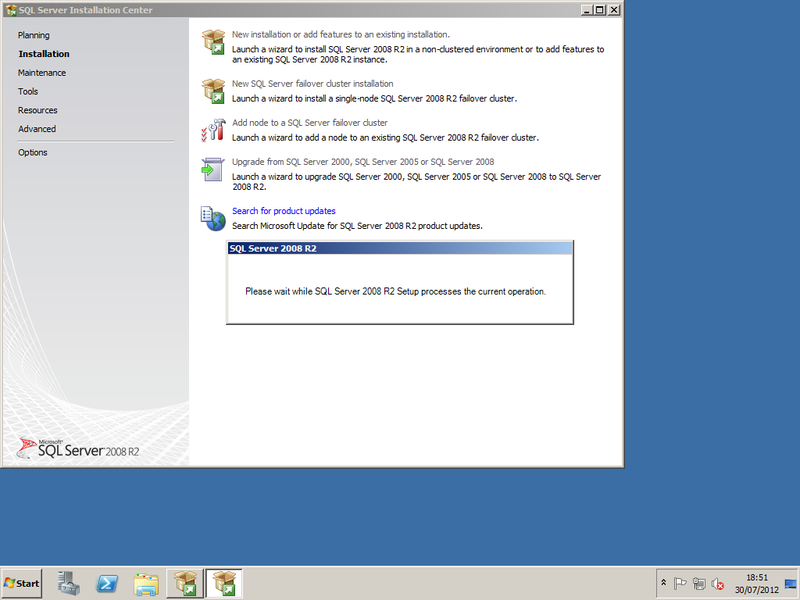 To enable this, select the web server in IIS, and then double-click ISAPI and CGI Restrictions. 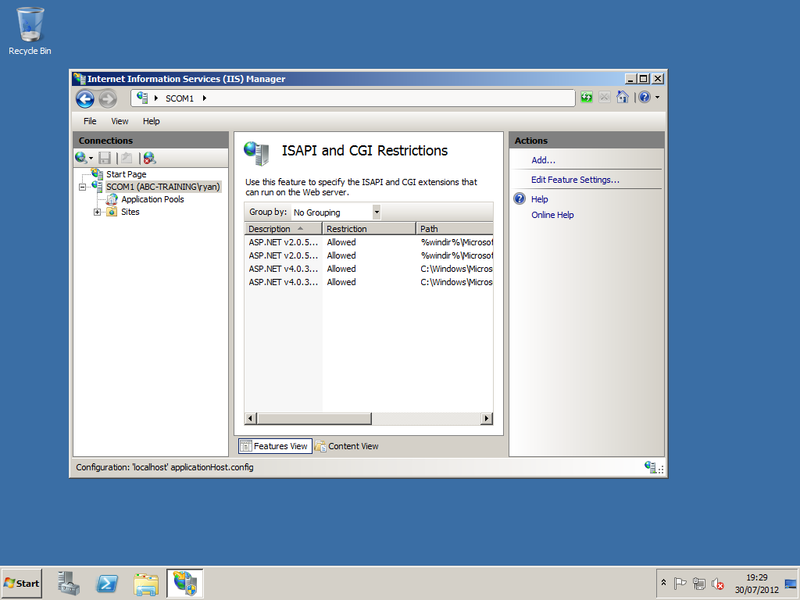 Select ASP.NET v4.0.30319, and then select allow. 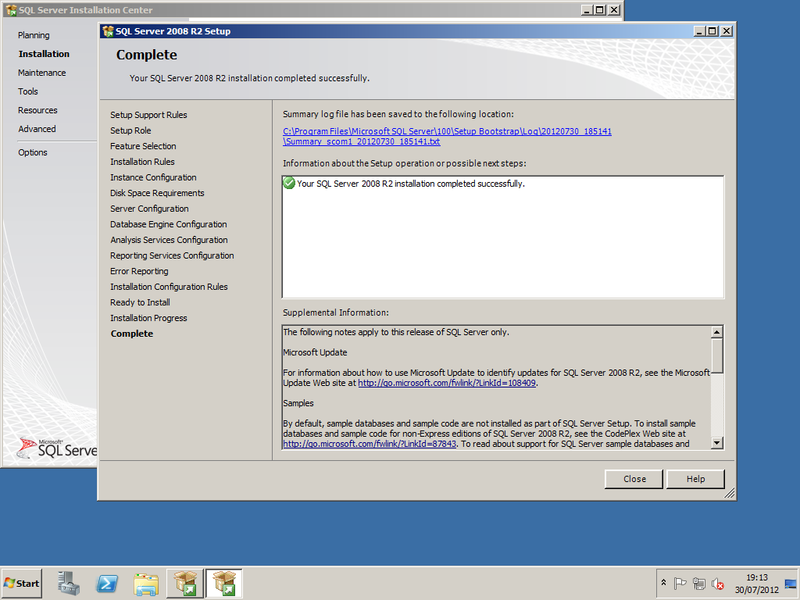 Install SQL 2008 R2 with: SSRS, Full Text Search and SQL Agent. 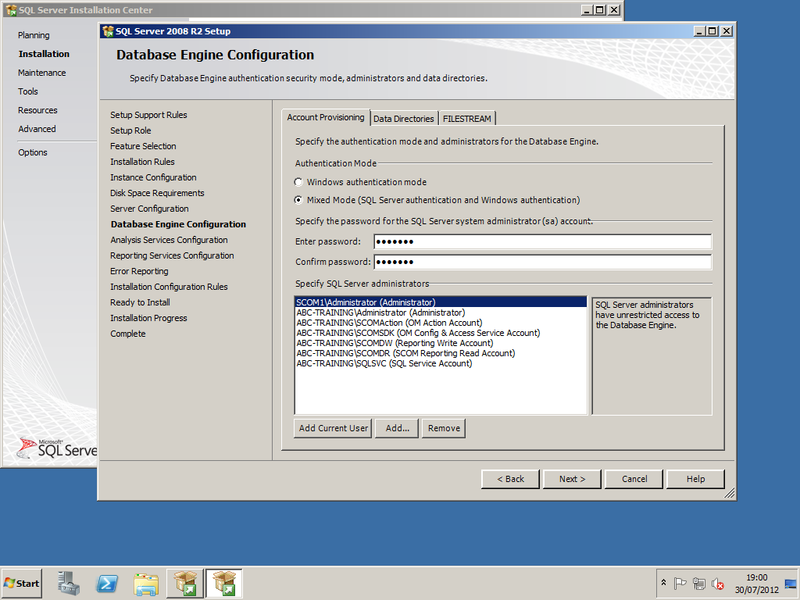 Ensure you set the SQL Agent to automatic. The SQL Agent is required for Application Advisor reports publishing and the Reporting Server option during setup. 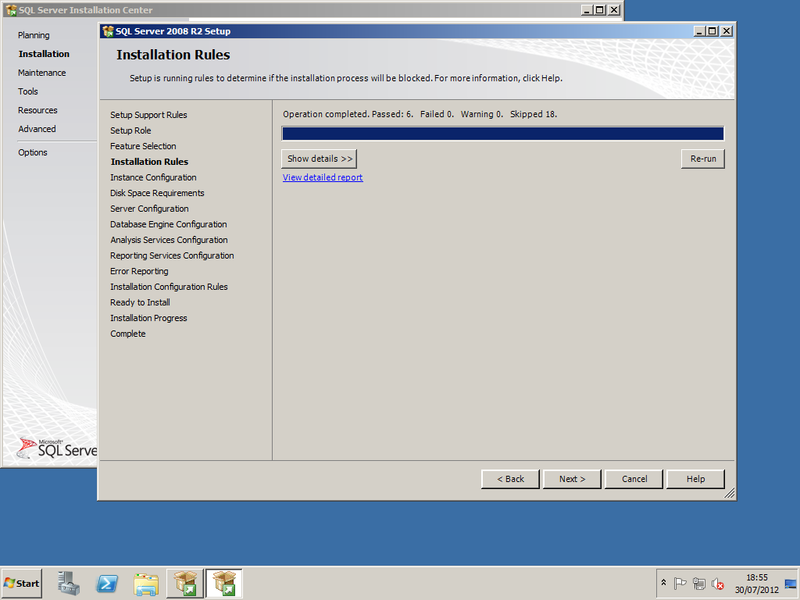 Select New Installation or added features to an existing installation. 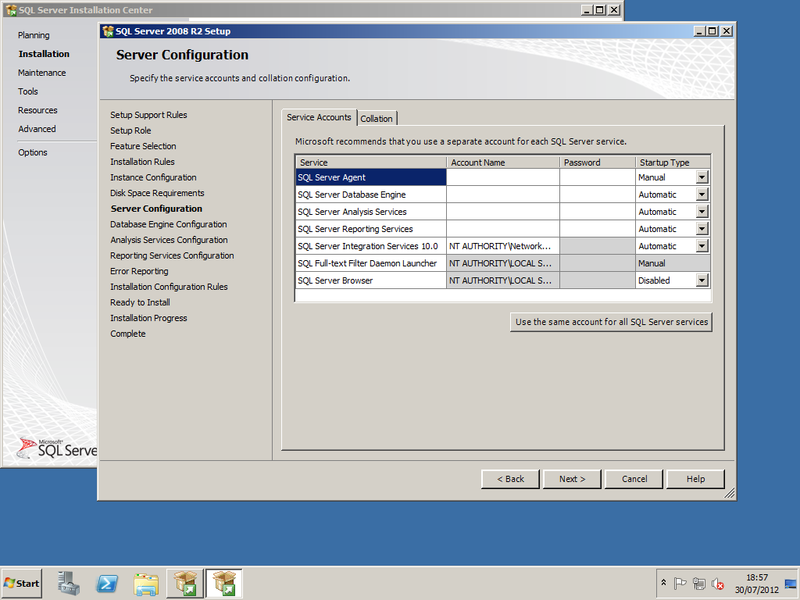 Set the SQL server collation to SQL_Latin1_General_CP1_CI_AS. 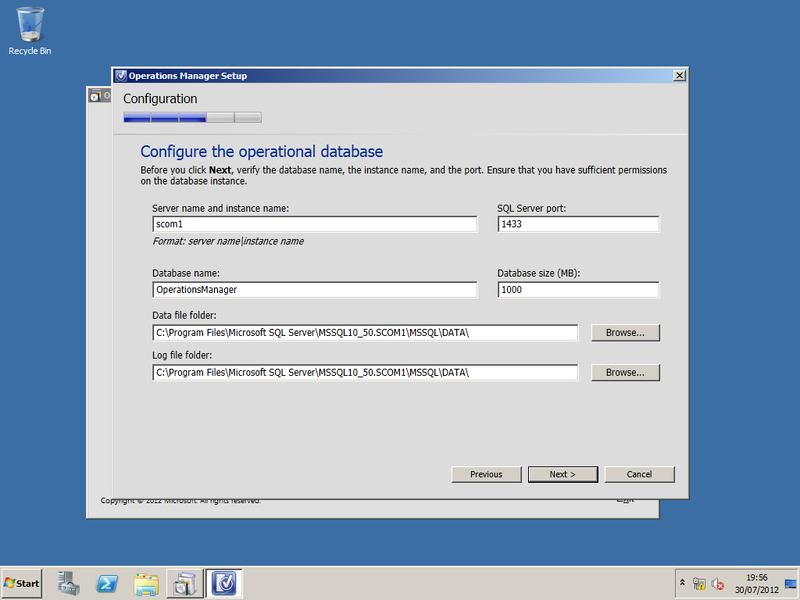 Ensure that Named Pipes is enabled in the SQL Server Configuration Manager. 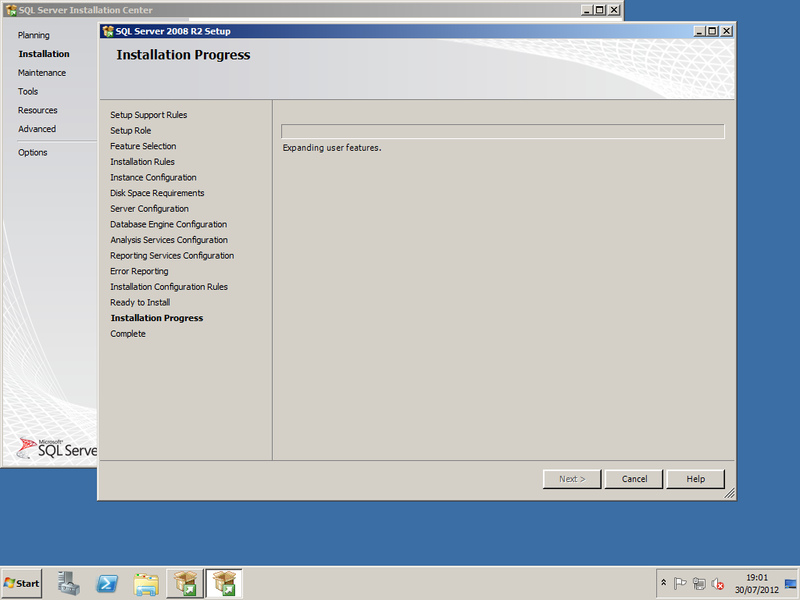 Select the Install option to begin with the SCOM installation. 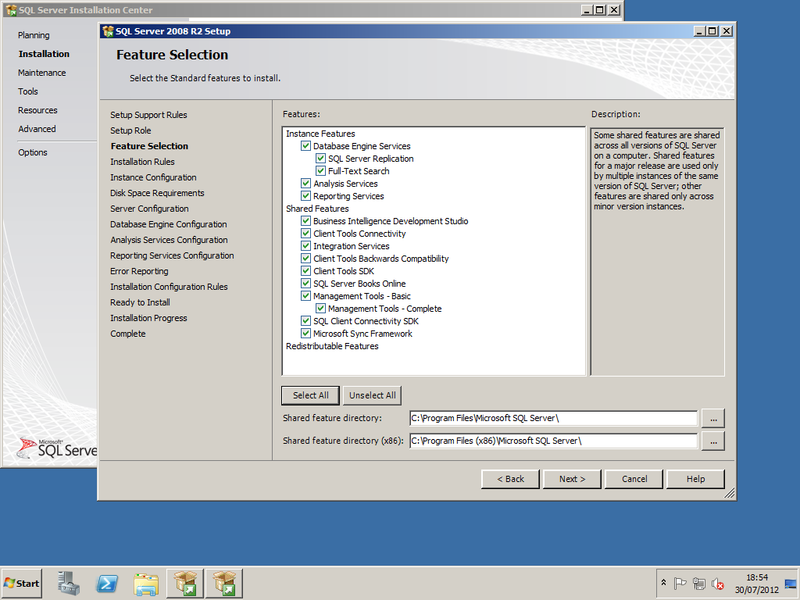 Select all components you would like to install. 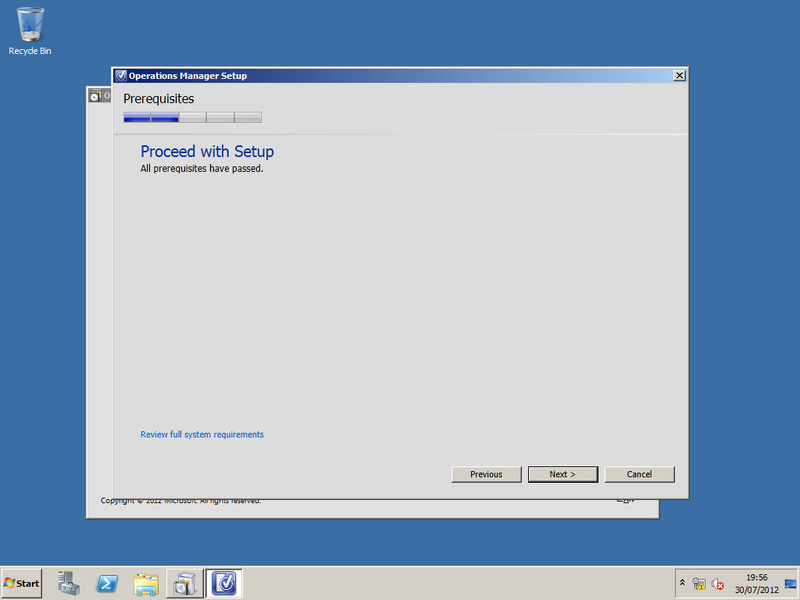 Use the default install path. 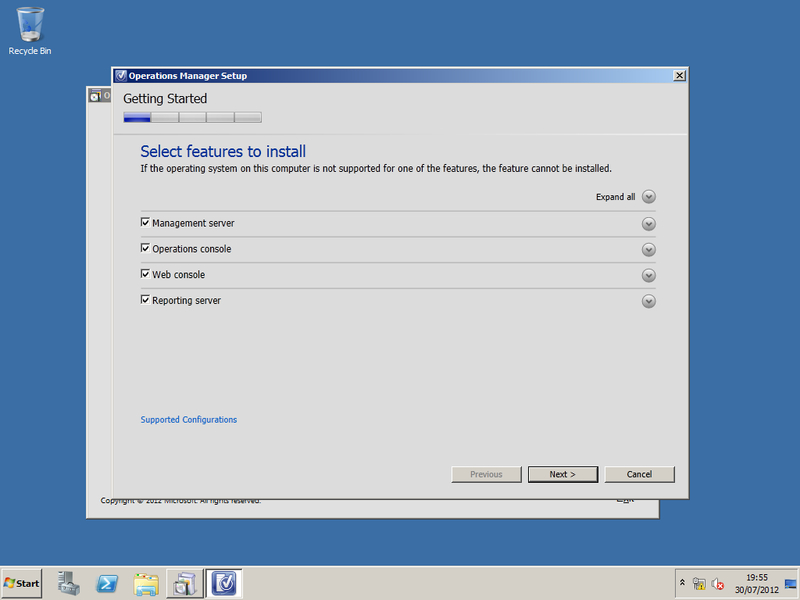 The Installer will run prerequisites for the hardware and software configuration requirements. Enter the management group name you would like. You can either add to an existing management group or create a new one. The SQL databases are the key core components to Operations Manager as they store the data and It is vital the details you enter are correct. 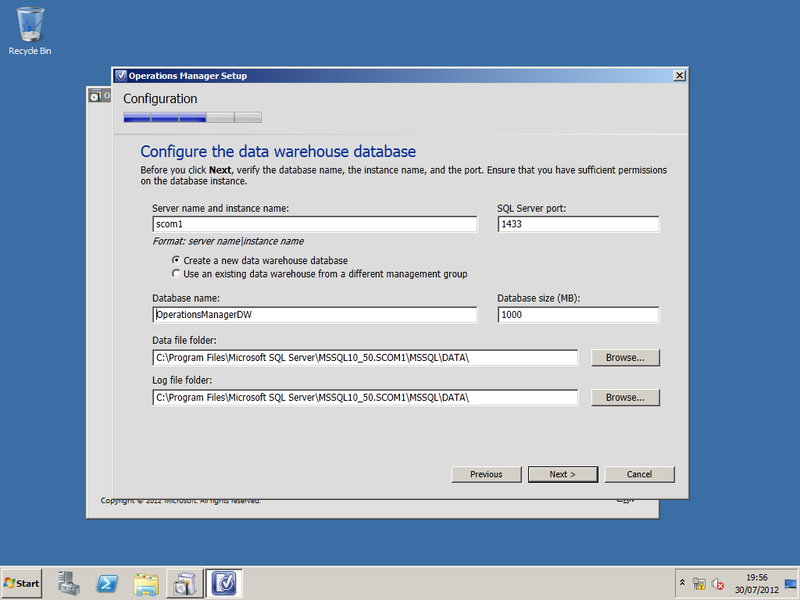 The database size is set to 1,000 MB and you can change this to suit your environment requirements. 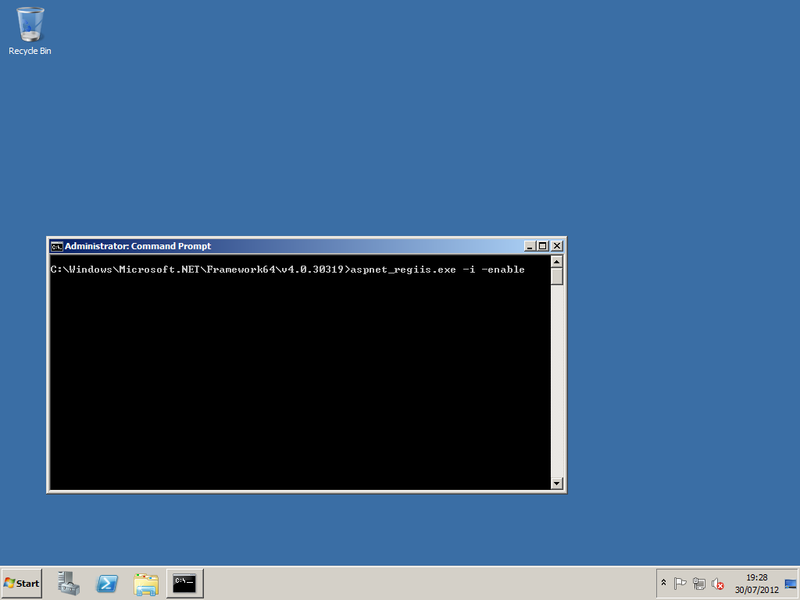 You can also change the Data file folder and the log file folder target address. 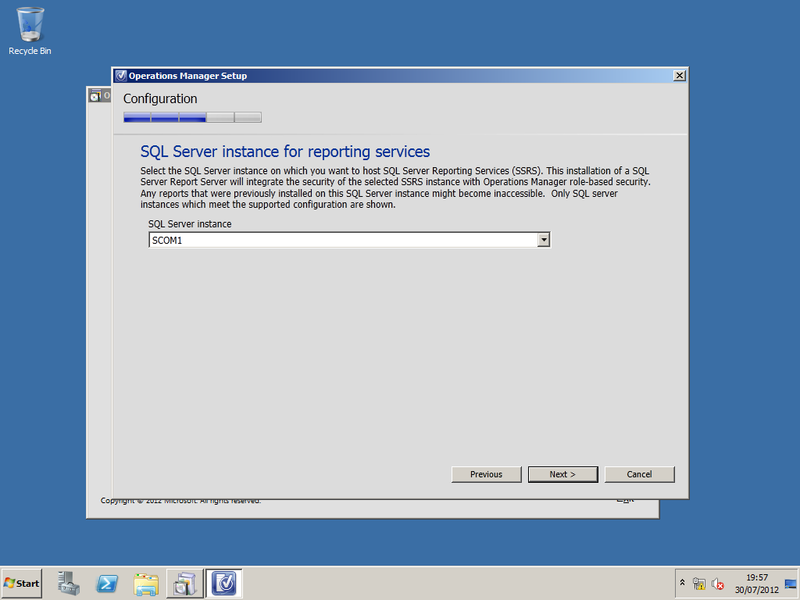 Select the SQL instance for reporting. Choose the website and select the Enable SSL if required. 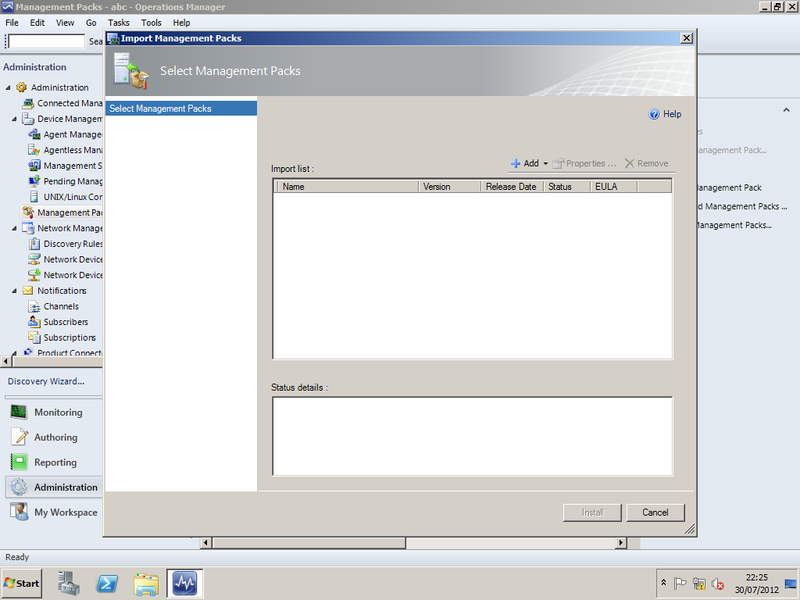 You should enable this feature in a production environment to protect network traffic. Mixed Authentication:No requirement to provide a user name and password if logged on to a domain environment. 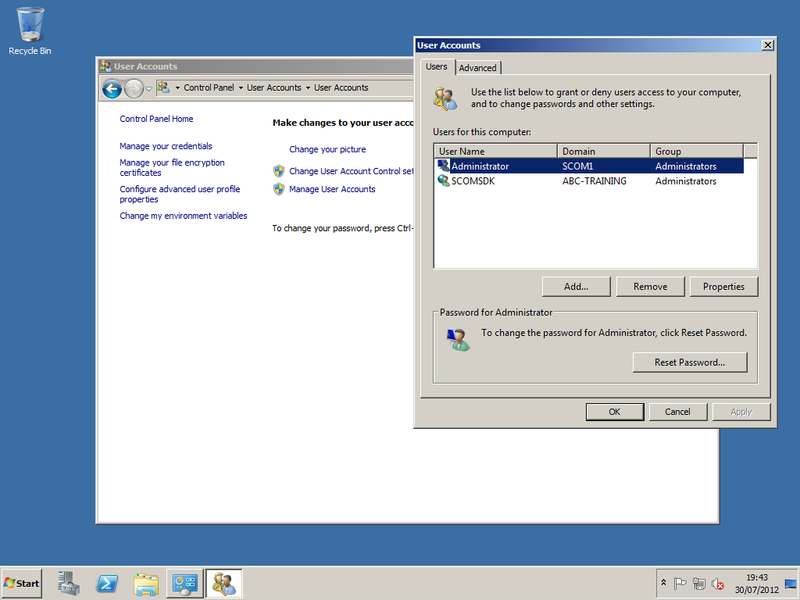 Network Authentication: users have to enter network credentials to login. 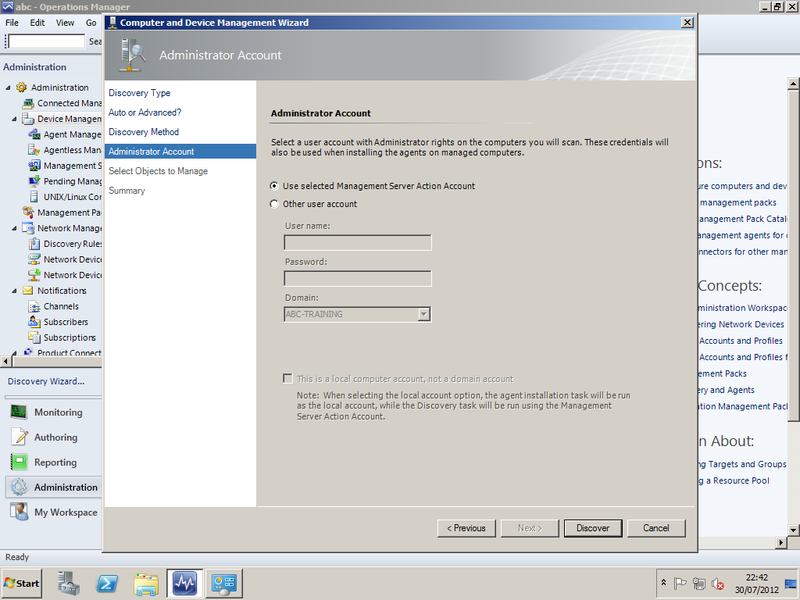 Enter the Active Directory service account details. If you do not want to manualy update operations manager it is suggested that you select on. 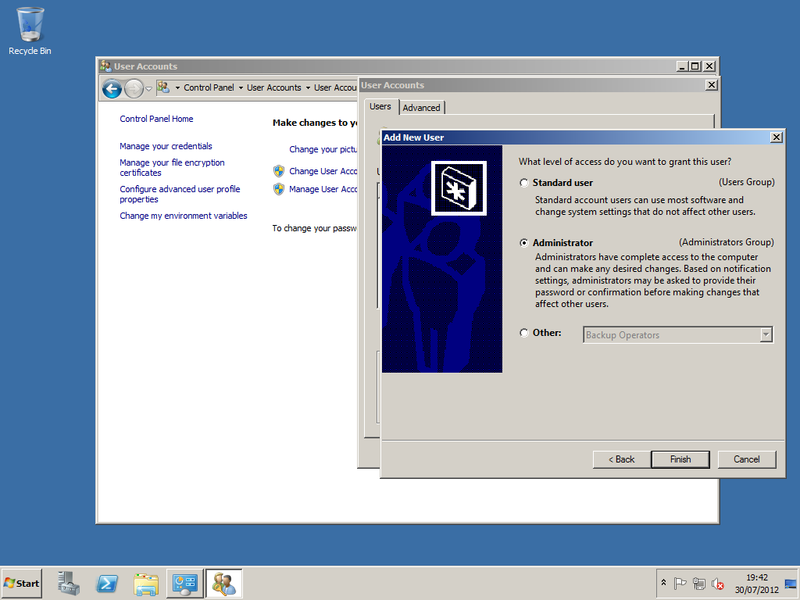 Run the MOMADAdmin.exe utility from the command line. 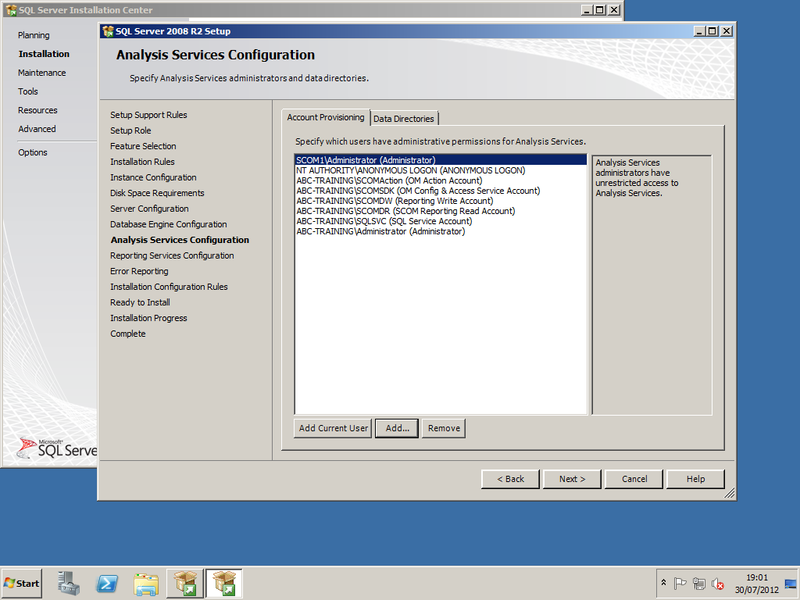 Create the “Message Ops” Management Group AD DS container in the AD DS schema root of the Domain. To create the same Management Group AD DS container in additional domains, run MOMADAdmin.exe for each domain. 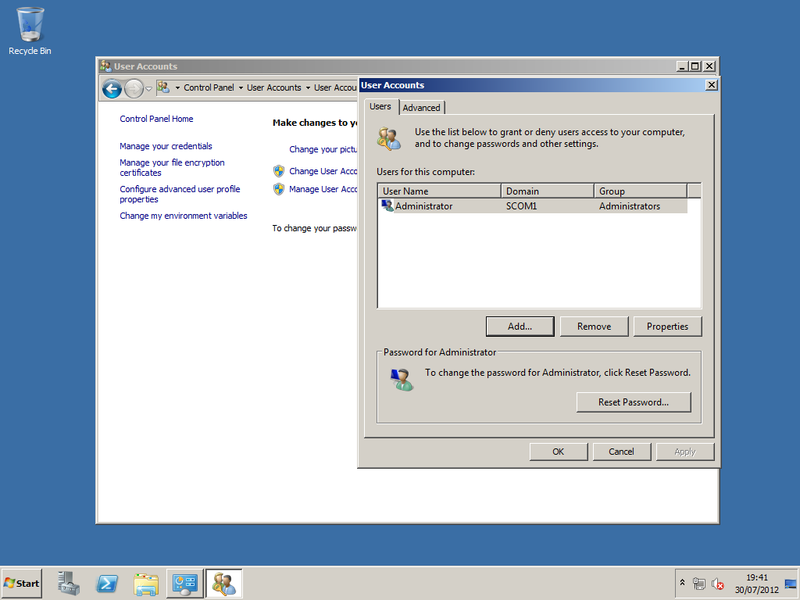 Add the DomainMessageAdAcct domain user account to the DomainMessageMOMAdmin AD DS security group and assign the security AD DS group the rights necessary to manage the AD DS container. 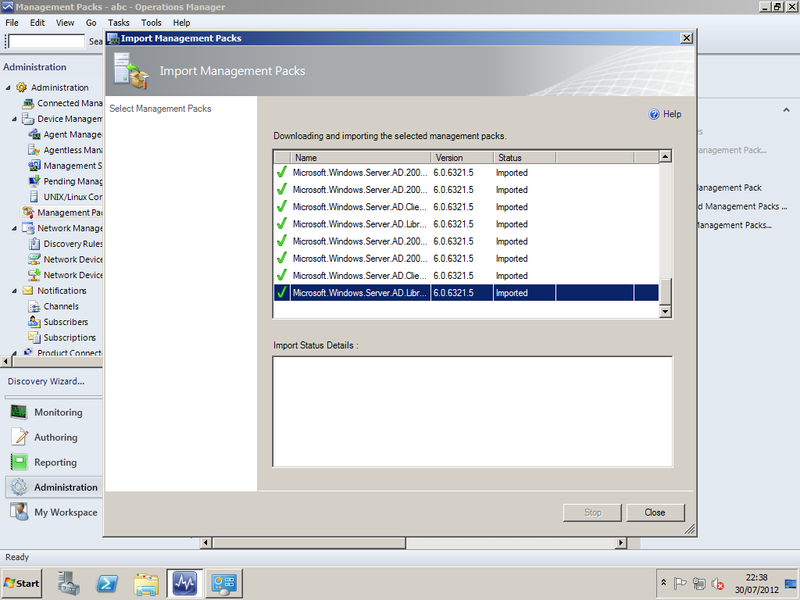 Once the management group is created you then can import the Active Directory management pack. You can download management packs from the online catalogue or from the local disks. 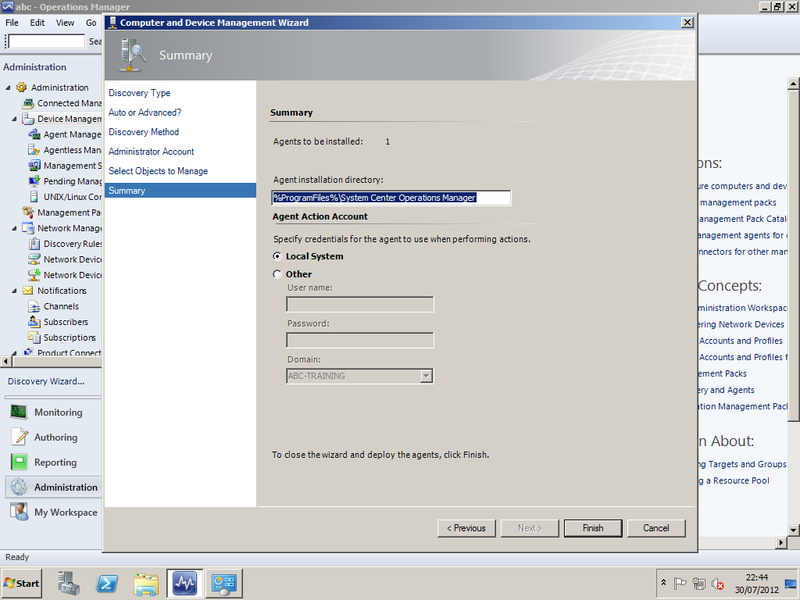 You can deploy agents using the deployment wizard located in the Administration menu. 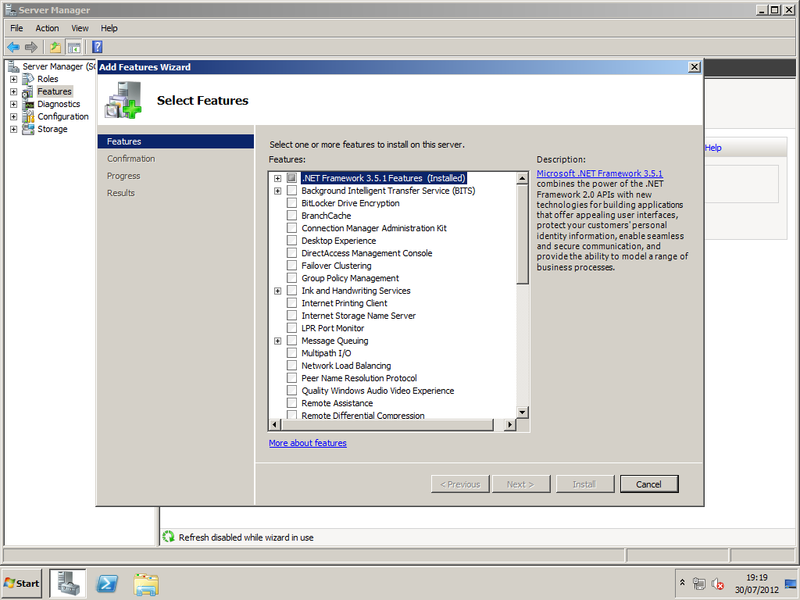 Select the devices you would like to deploy agents to , in this case we will be wanting to deploy a windows agent to the Domain Controller. 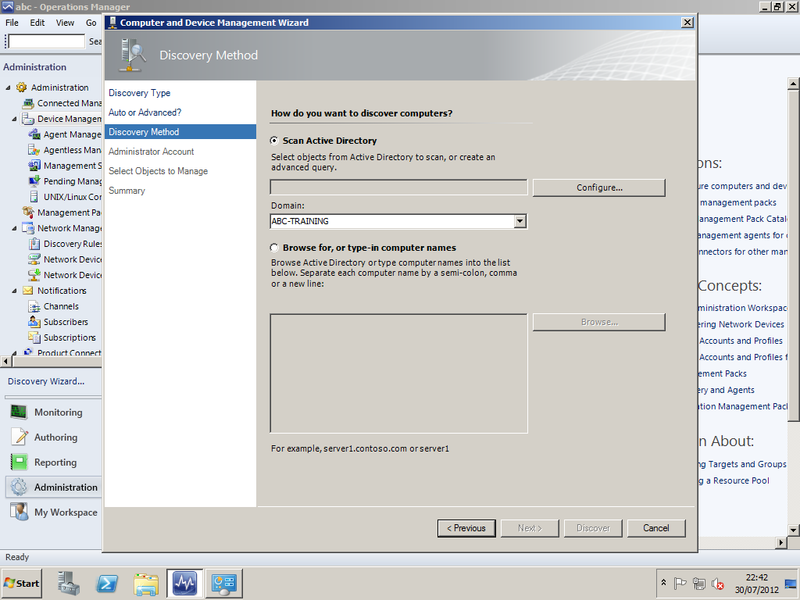 Select browse for, or type-in computer names and select the Domain controller. Use the Default setting and click discover. 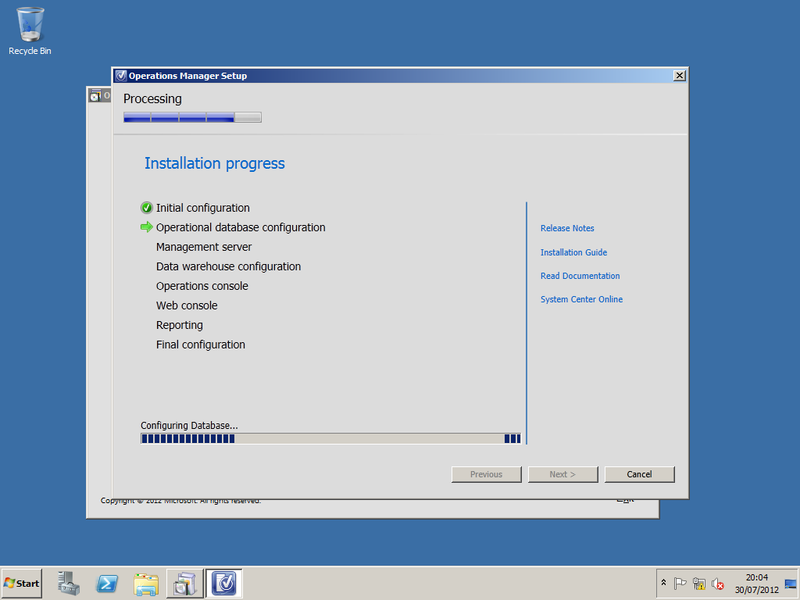 As you can see from the screen shot above, SCOM is deploying the agent to DC01. 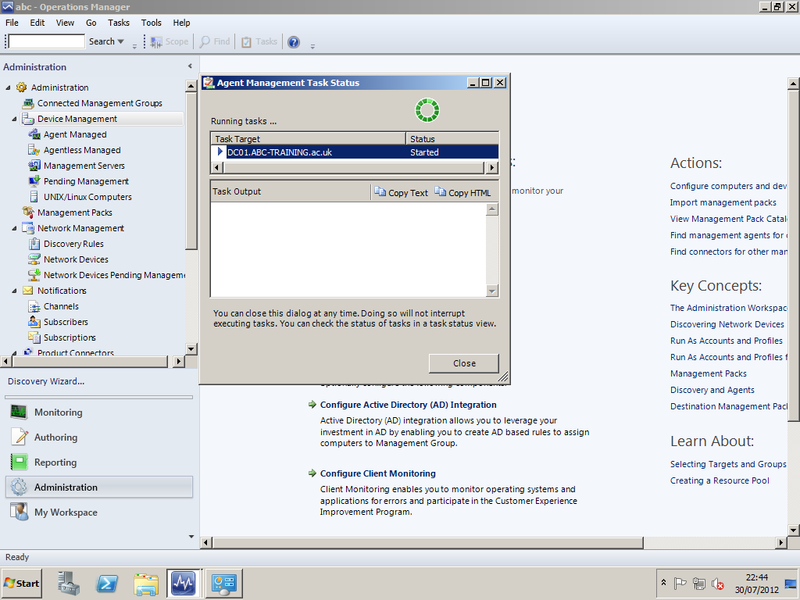 The screen shot above shows the monitoring agent running on the client. 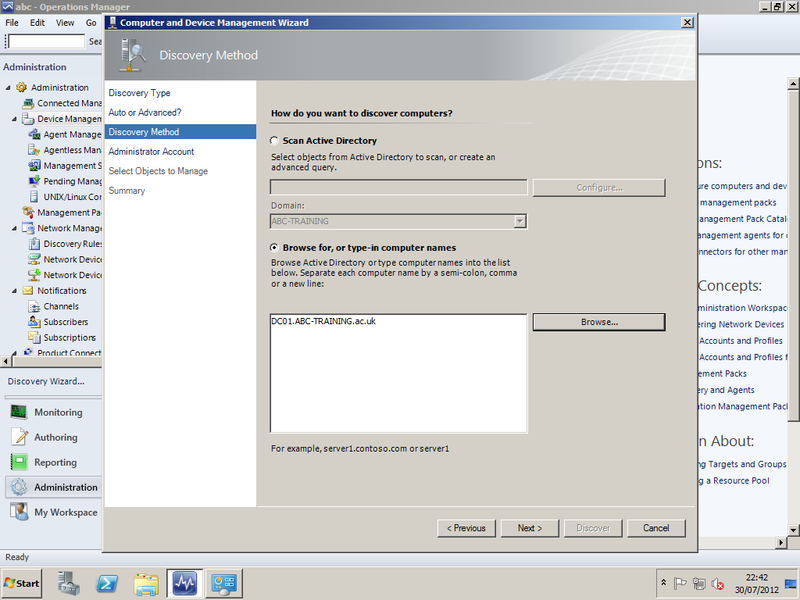 Once the Active Directory Management Pack is installed and configured, you will be able to monitor the Active Directory environment. Microsoft. (2012). 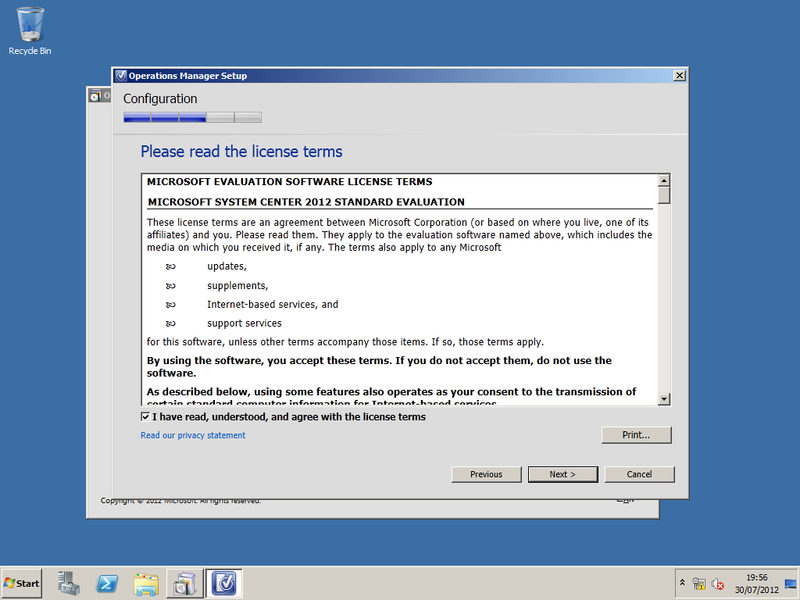 Microsoft System Center 2012. 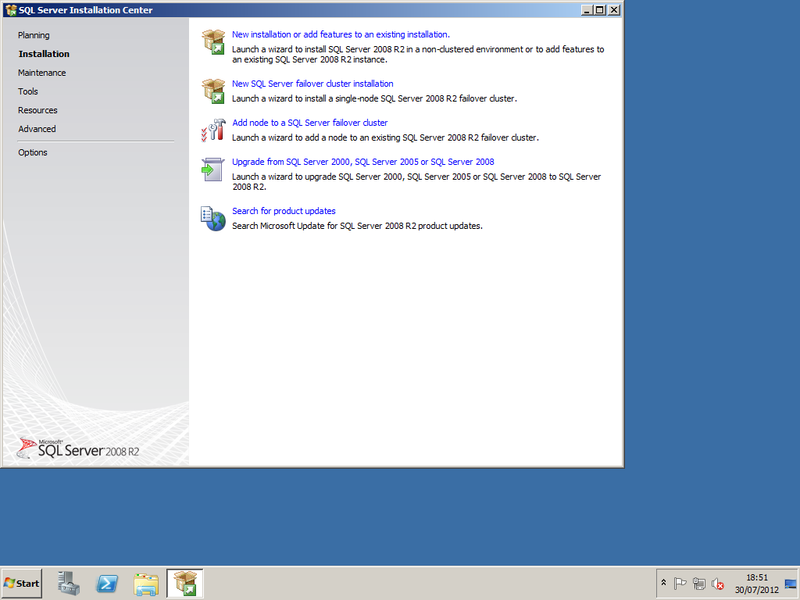 Available: http://www.microsoft.com/en-us/server-cloud/system-center/default.aspx. Last accessed 24 Jun 2012. 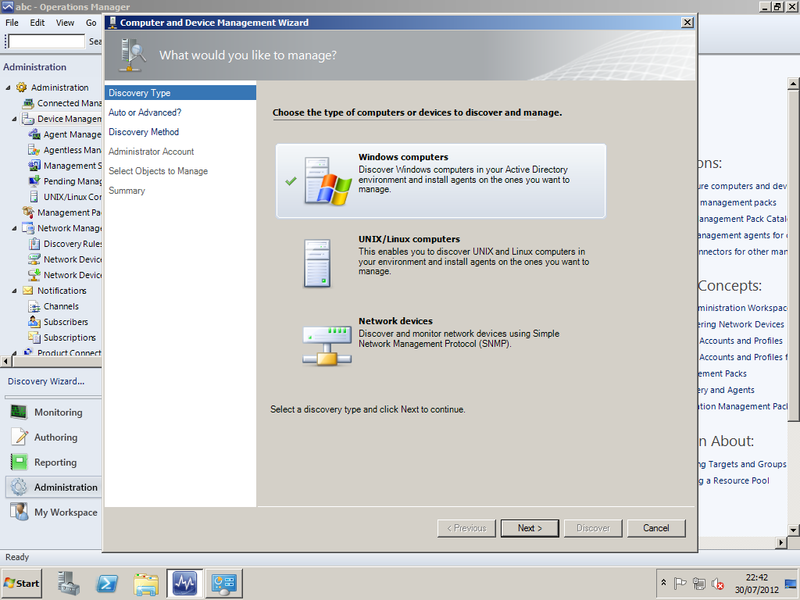 Microsoft. . How to Create an Active Directory Domain Services Container for an Operations Manager 2007 Management Group. Available: http://msdn.microsoft.com/en-us/library/bb309685.aspx. Last accessed 15 july 2012. Microsoft. (April 1, 2012). 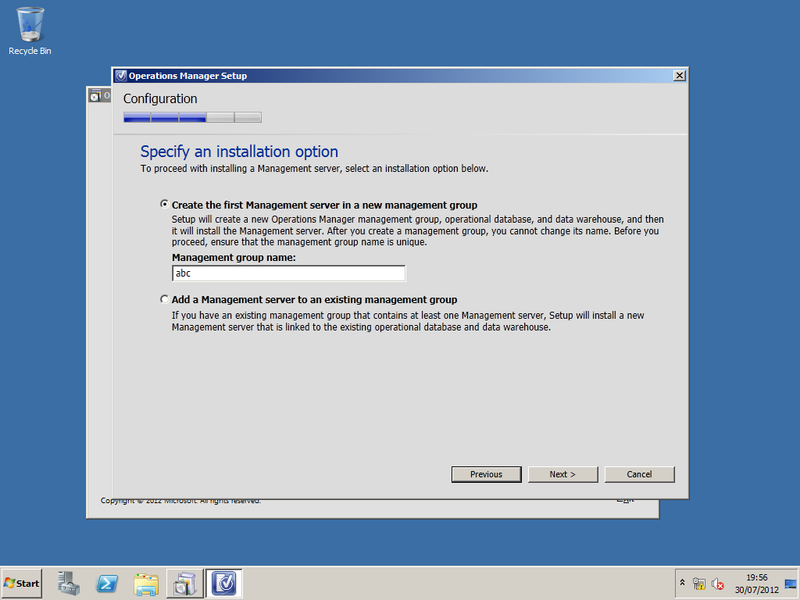 How to Create an Active Directory Domain Services Container for a Management Group. 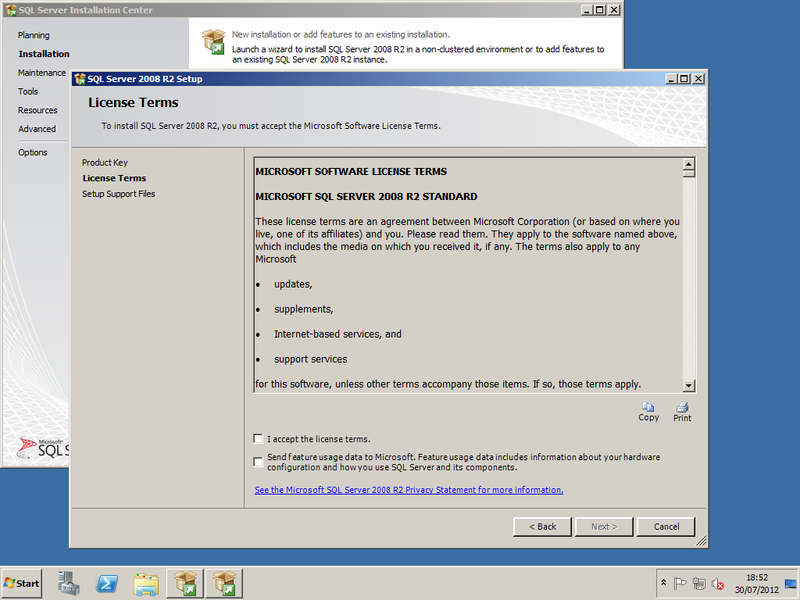 Available: http://technet.microsoft.com/en-us/library/hh212738.aspx. Last accessed 15 july 2012. Microsoft. (2012). System Center Technical Documentation Library. Available: http://technet.microsoft.com/en-us/library/cc507089.aspx. Last accessed 15 july 2012. SatyaVe. (1st April 2012). 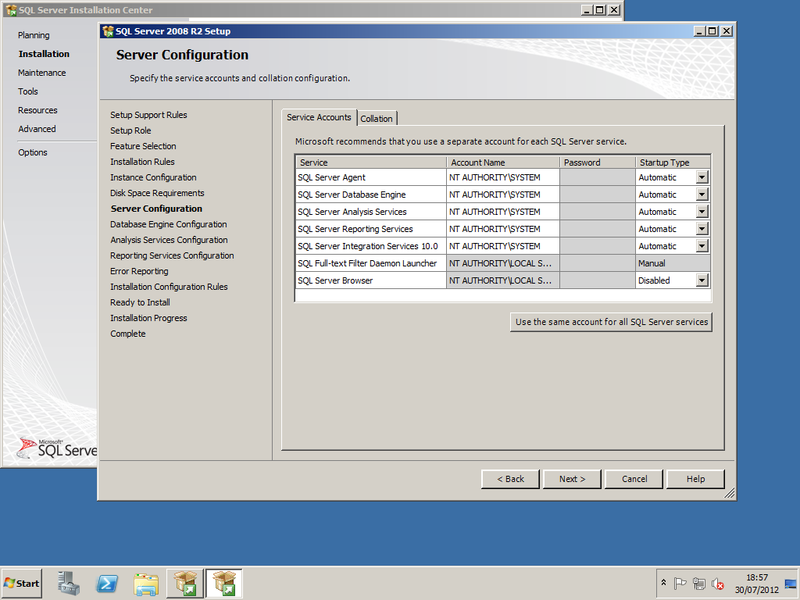 System Center: Operations Manager Engineering Blog. 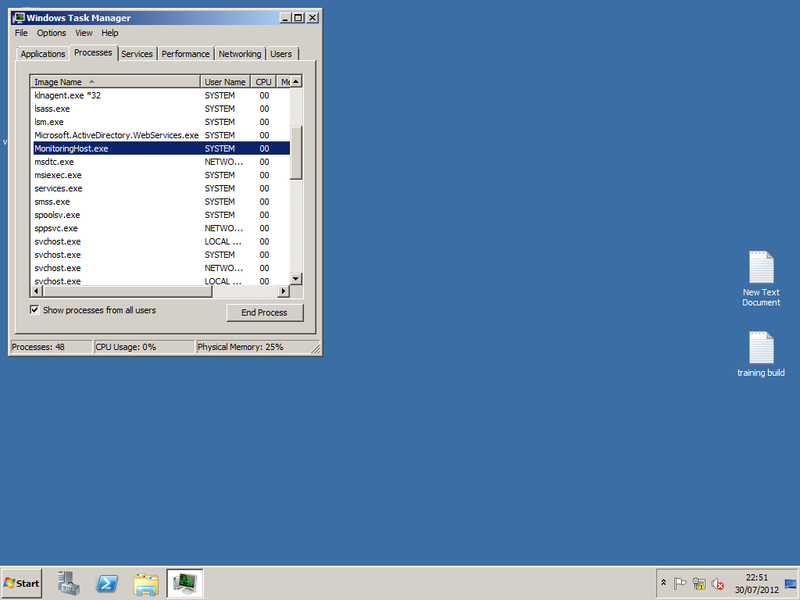 Available: http://blogs.technet.com/b/momteam/archive/2012/04/02/operations-manager-2012-sizing-helper-tool.aspx . Last accessed 15 july 2012. Dear Ryan, i have a query can we deploy ACS database, datawarehouse database on a single server functions as a reporting server. I would not recommend installing ACS, the reporting services, and the datawarehouse on the same server for a number of reasons one being performance. 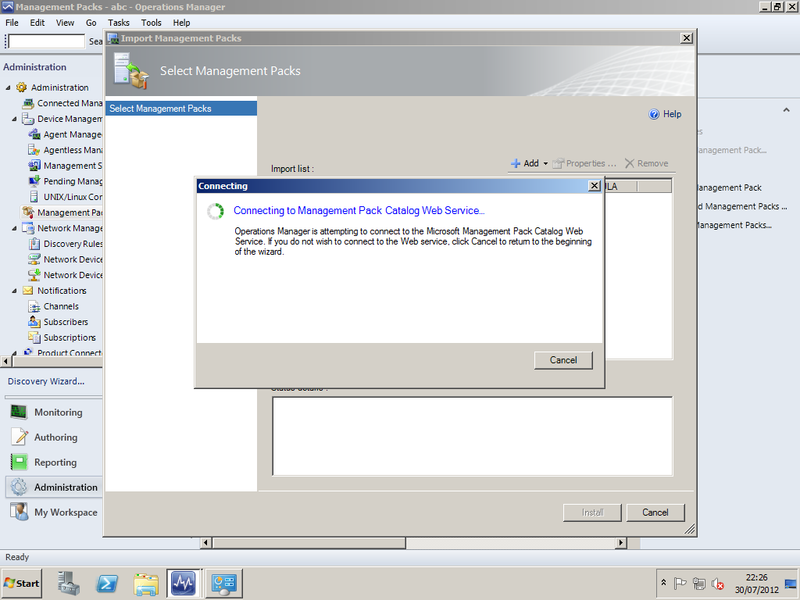 You would be better off creating a SQL failover Active/passive cluster. Unfortunately you cannot cluster reporting services, but you can install the reporting services on one of the SQL Cluster nodes. I would avoid trying to cram all SQL instances into a single server. To keep things tidy, save your self licences and time, create a cluster. There may be an unsubscribe link at the bottom of the emails.